What inspires you to contribute to a sustainable world? What is the most urgent action businesses today should take to address employee leadership & personal development? In my work, I see that our education systems do not pay attention to human development, so employees are not adequately equipped to take responsibility for their own resilience in our exponential changing times. In your experience, which organisations are utilising this responsibility? I experience that it depends on specific individuals in organisations, in general, it is not a usual policy. 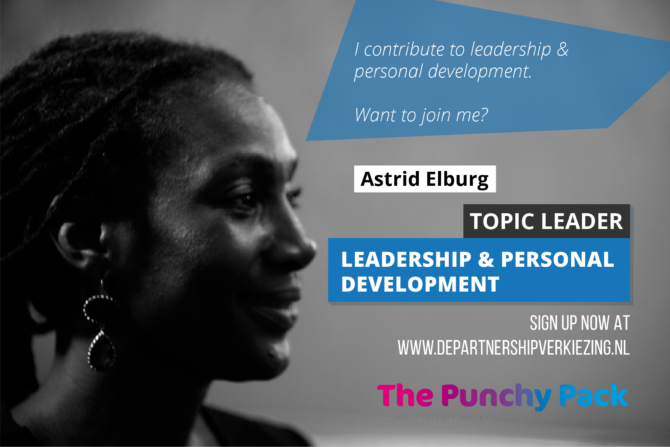 How can young professionals utilise leadership & personal development to contribute to creating sustainable solutions? Young professionals should know that they might be at mental risk if they do not pay attention to develop personal life strategies. They should understand that investing in personal development will give them strength and direction so they will be more flexible and agile in the world of today and tomorrow. What advice do you have for young professionals participating in the Partnership Verkiezing? Learn, earn and return. Maximise yourself and unlock the talents of others. Do you want to learn more about this Topic and/or join the next Partnership Verkiezing? Send us a message!